British Juniors Win Olympic Hopes Cup. 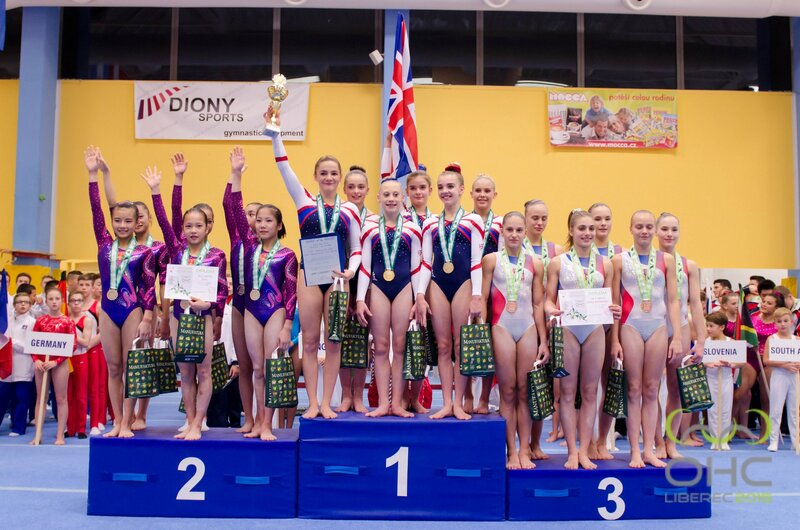 Congratulations to the young team from Great Britain who won the Olympic Hopes Competition in Liberec, Czech Republic. The team of Alice Kinsella of Park Wrekin, Megan Parker City of Birmingham, Latalia Bevan St Tydfils, Jolie Ruckley Cardiff Olympic, Teal Grindle Sapphire School of Gymnastics, and Amelia Montague Tolworth, claimed the gold with 212.20 over the team from China in second, and the Czech A Team in third. The entire Chinese team will be senior next year, whereas only Teal from the British Team will be, and Jolie is still an Espoir, so a fantastic achievement for the girls. Even more success came in the AA competition with Alice taking the top spot AA with 53.90. Latalia placed 6th AA with 51.60, Jolie 7th with 51.50, Megan 10th with 51.10, and Amelia 19th with 48.70. On individual pieces Alice was 1st on vault, and =1st on beam. Megan was 2nd on bars, Teal 2nd on beam, and Latalia 2nd on floor and 3rd on vault. It didn’t all go perfectly, there were falls and errors. There was also some absolutely lovely performances that leave the impression that the future of British gymnastics is artistry focused with some beautiful young gymnasts coming through. It was great to see Teal back in competition, she has worked so hard to climb back from injury. Although all the difficulty isn’t back yet, and she’s not back on bars, you can see the quality of work is still very much there with Teal, and she will be getting stronger and stronger over the months to come. Teal vaulted a straight Yurchenko, I didn’t see her beam, but she finished well on floor with a two an a half twist, double tuck, one and a half to straight front, and finished with a double twist. Alice looks like she will be challenging for the Junior title next year as well as a place on the Junior European team, there is going to be some very strong competition to get on that team when April comes round. Alice vaulted a Yurchenko full, she was solid on beam, and also very stylish. A great double spin, free cartwheel layout, free walkover, and a good two and a half twist dismount. On floor she had a lovely new routine that really suits her, and she performs beautifully. Alice was a bit bouncy on her landings today which kept her score down from where it would be, but she tumbles one and a half to double twist, double pike, two and a half twist, and double tuck. Latalia wasn’t shown that much on the live feed unfortunately, but her floor was, and as ever it was simply beautiful. Double pike to open, one and a half to front full, two and a half to finish. great leaps and spins, and such attention to detail and performance throughout the entire routine. Jolie again wasn’t on the live feed too much, but she vaulted strongly with her straight Yurchenko, and clearly performed well all around as she finished 7th overall. I look forward to seeing Jolie at the British Espoir Championships in a few weeks time, where she will be challenging for medals. Megan did very well on bars, great lines, and cleanly through for an 8.70 E score which is very hard to come by when you consider only two gymnasts in the whole of qualification at the World Championships were that clean, and only three in the final. On beam she was beautiful as ever, every time I see Megan compete I comment on the quality of her work, it really does stand out. Great flick layout layout, she hesitated after the split leap though and kind of threw the free cartwheel which caused her to fall. The feed cut in and out of her floor which was frustrating, but I did see the triple twist opening tumble, and the same quality dance and performance level she brings to beam. Amelia had a mixed day in her first international, she had a stumble to the side on her straight Yurchenko, then had a problem on bars which the feed just caught the end of, I think it might have been into the Endo which she repeated, she then unfortunately came away from the bar on the Jaeger. She also had a little trouble on her shoot half, and in controlling her dismount. The feed didn’t show it, but it looks like she did very well on beam, and she also has a beautiful new floor routine on a par with her last one Amelia is another tidy young gymnast, with great performance quality, and strong potential. 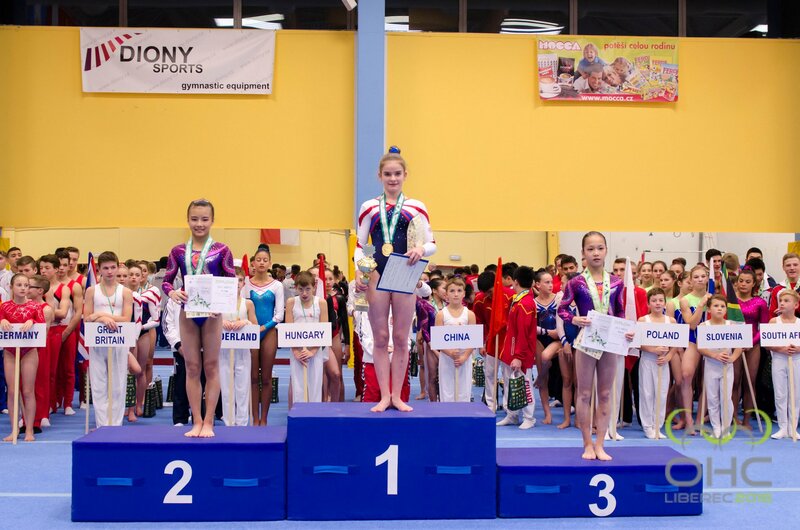 November 7, 2015 in Competition, Development, Gymnastics News, Reports. ← GB Juniors at Olympic Hopes. Team Info, Schedule, Start Lists, Live Stream.